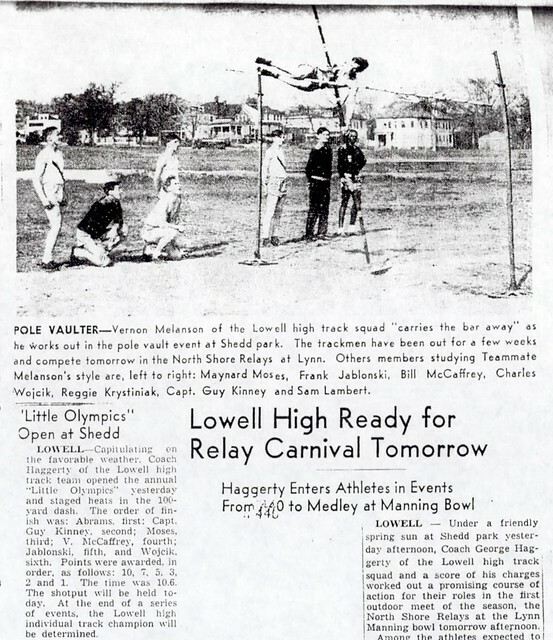 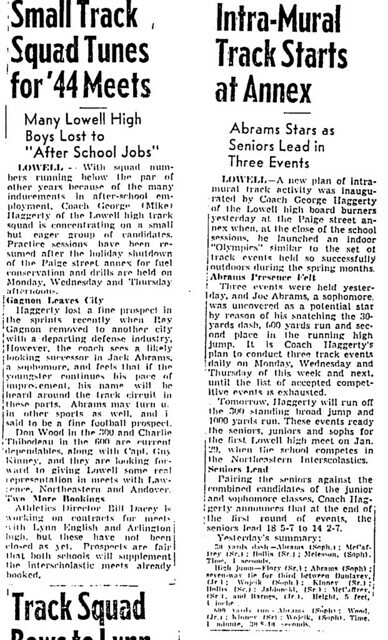 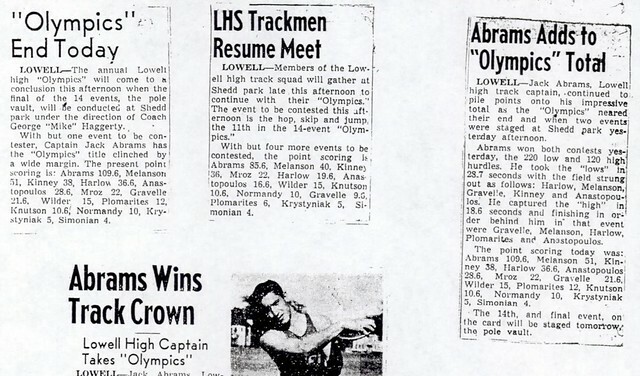 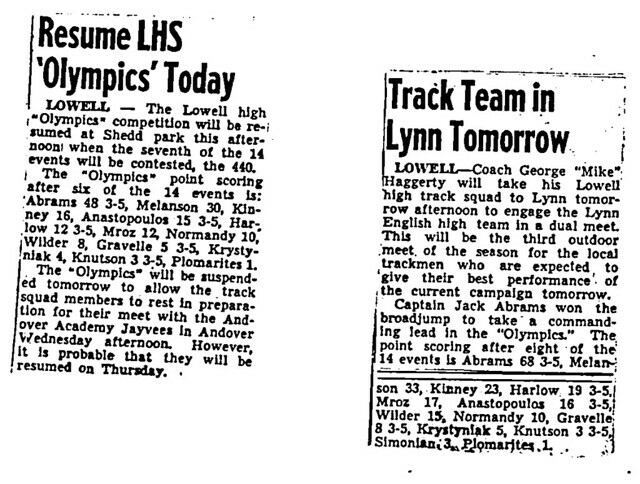 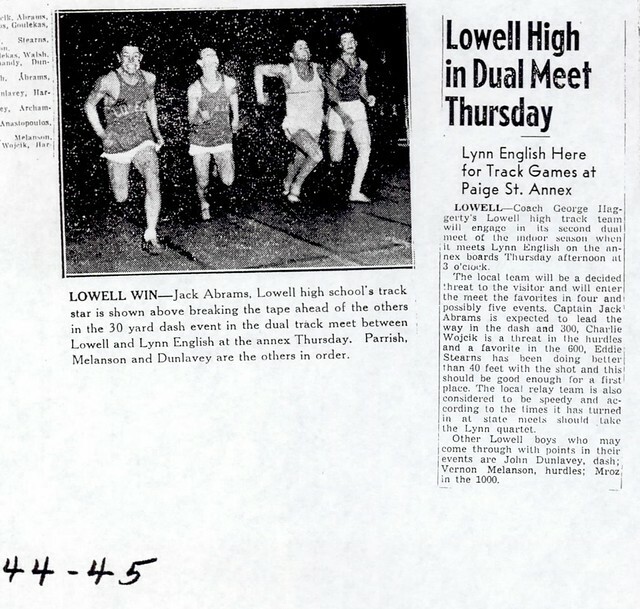 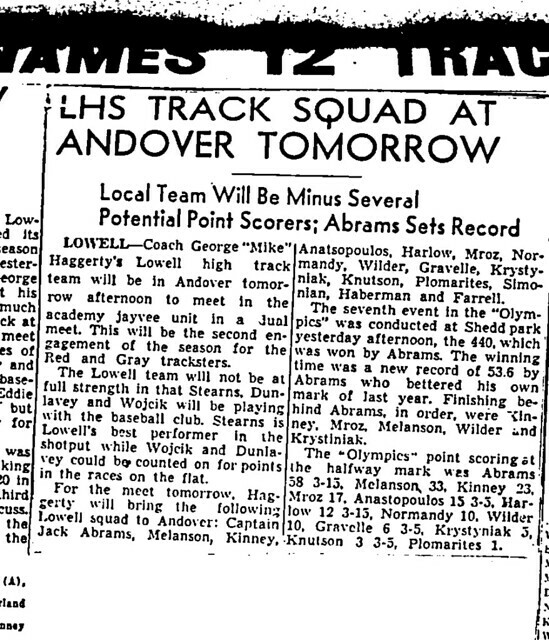 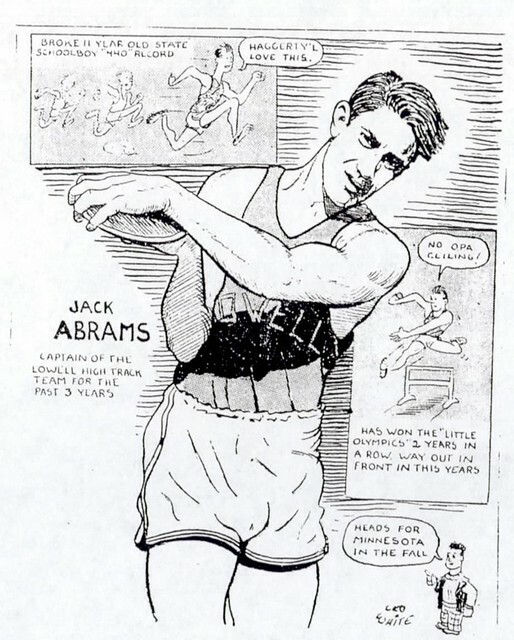 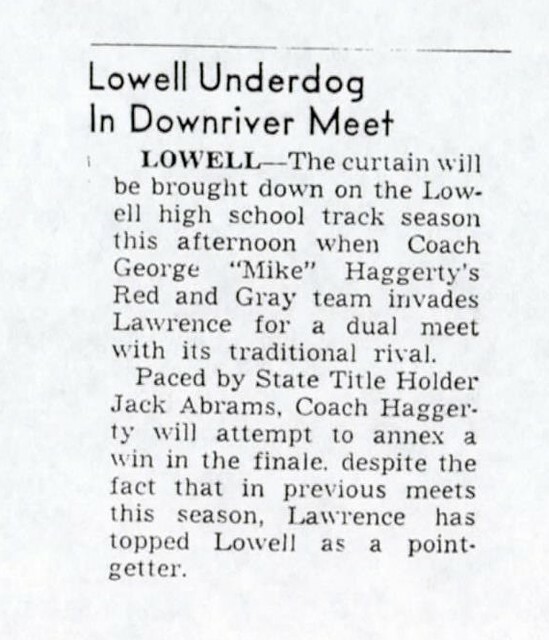 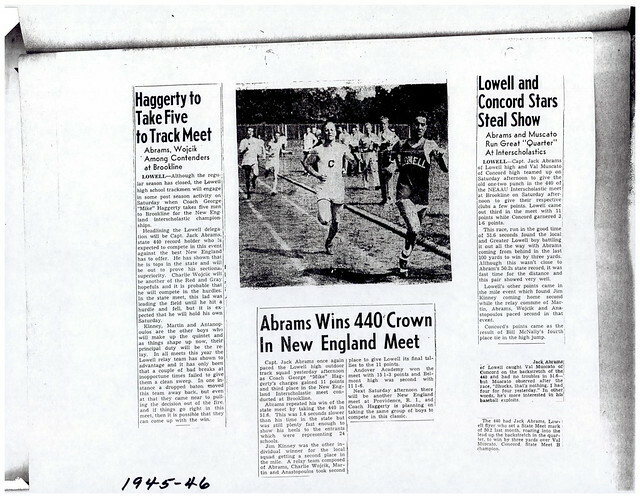 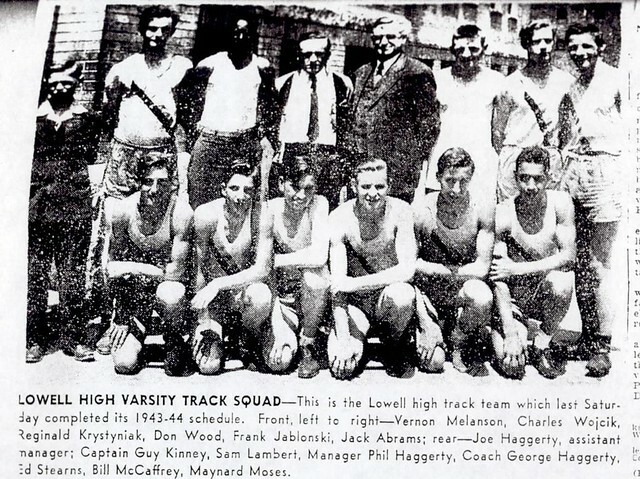 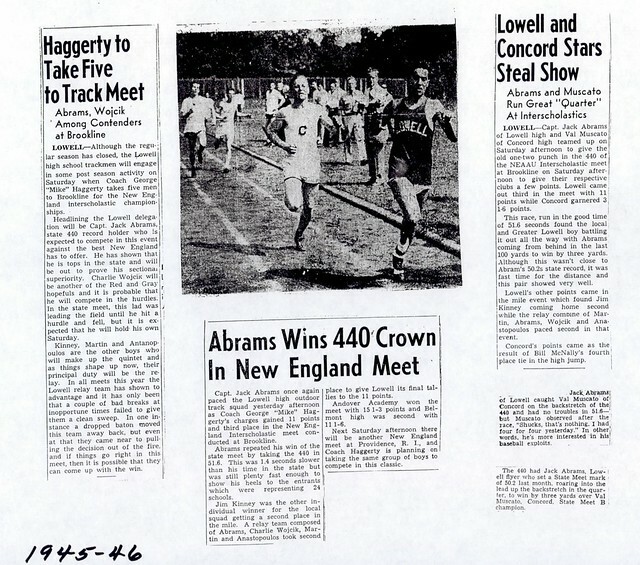 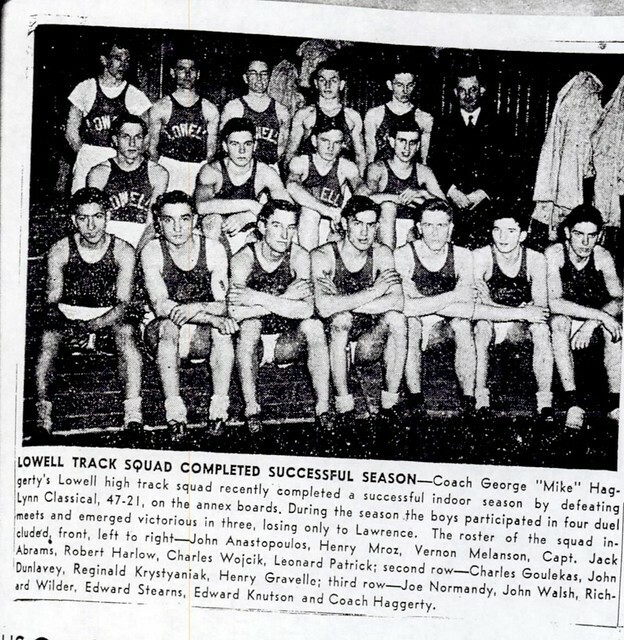 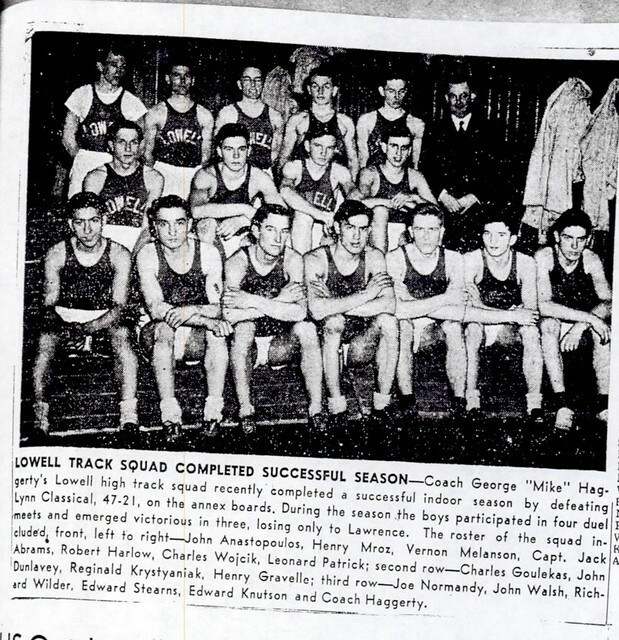 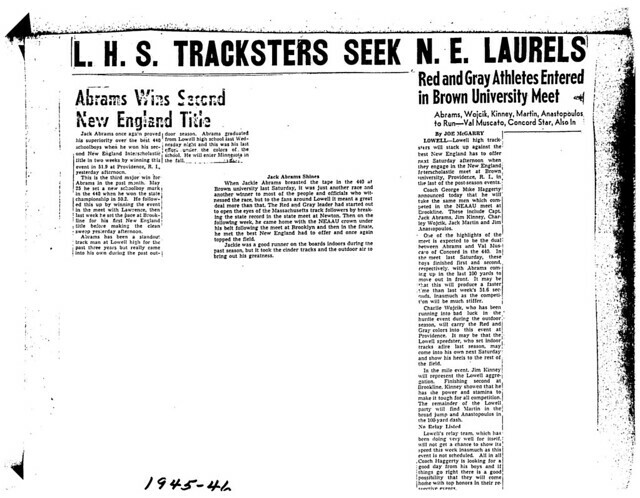 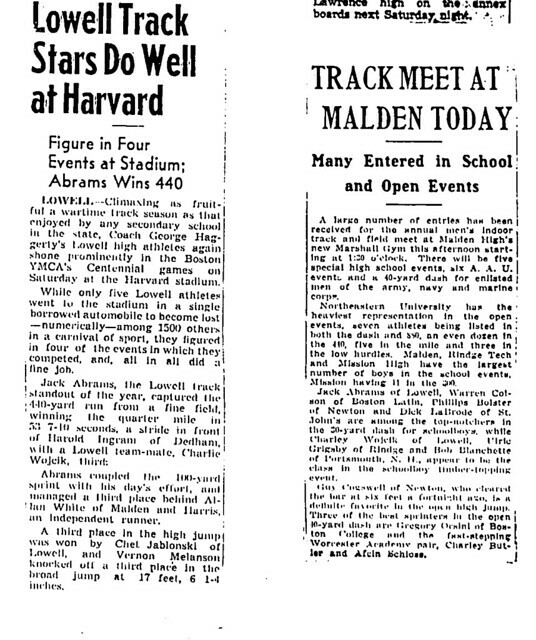 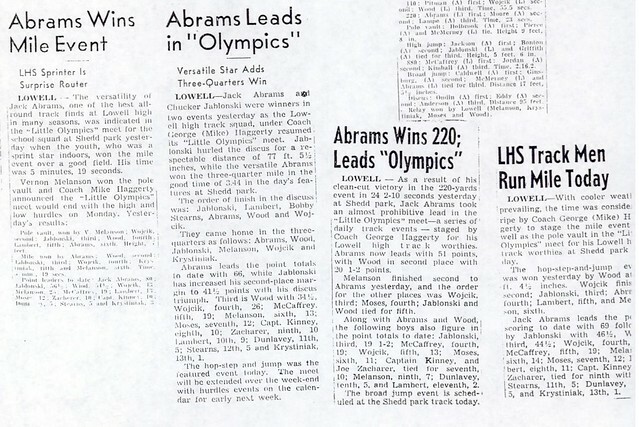 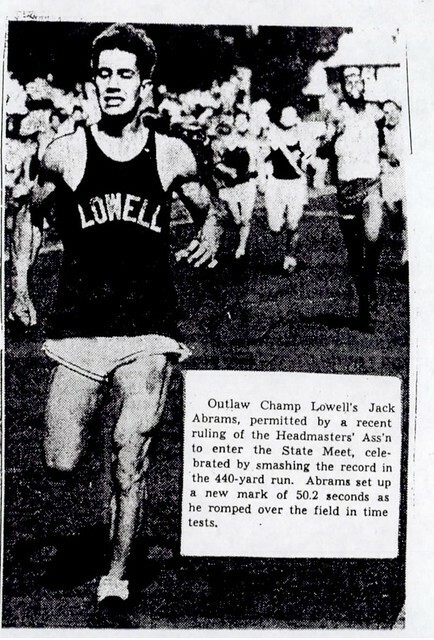 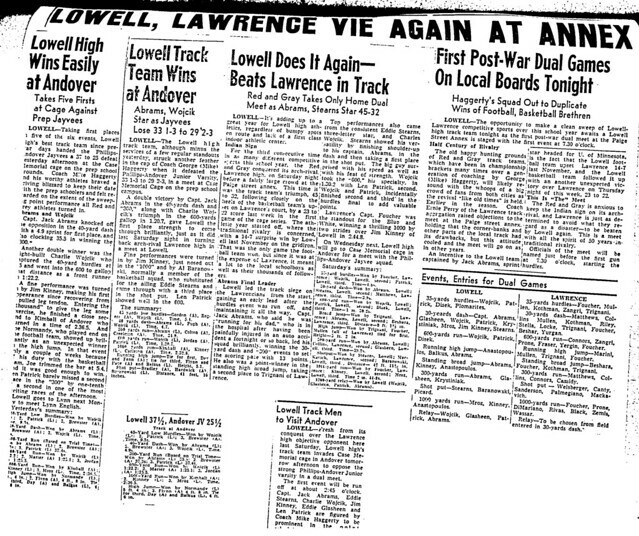 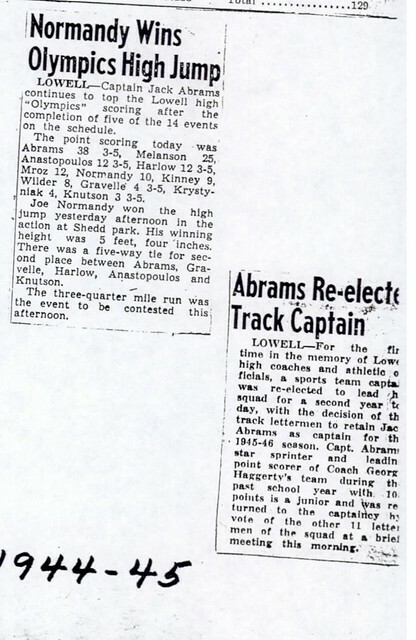 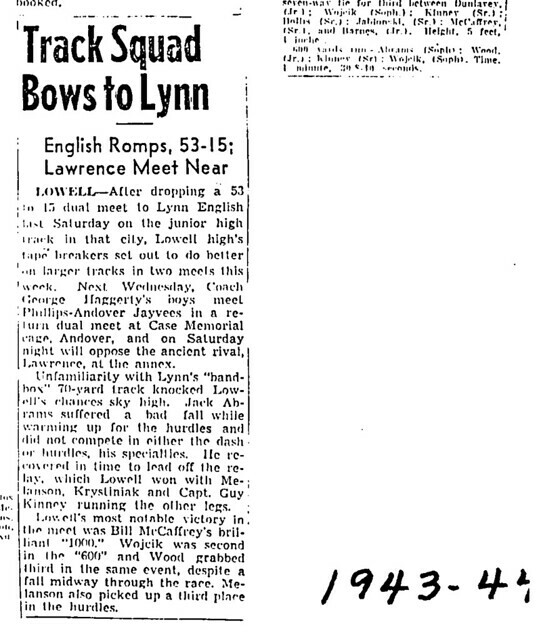 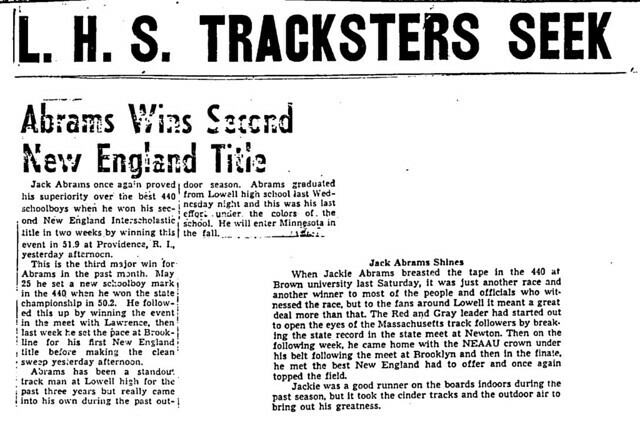 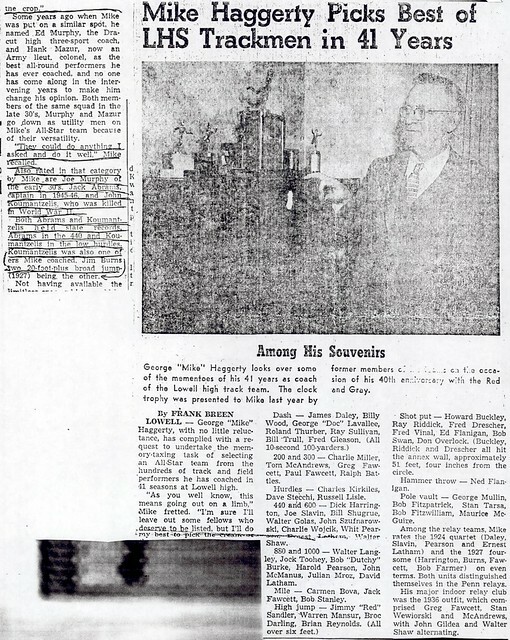 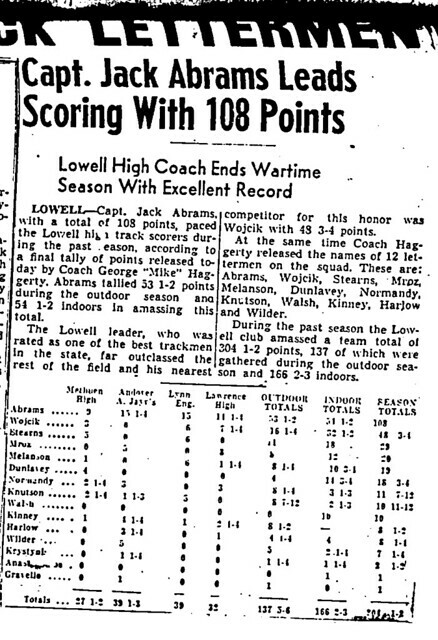 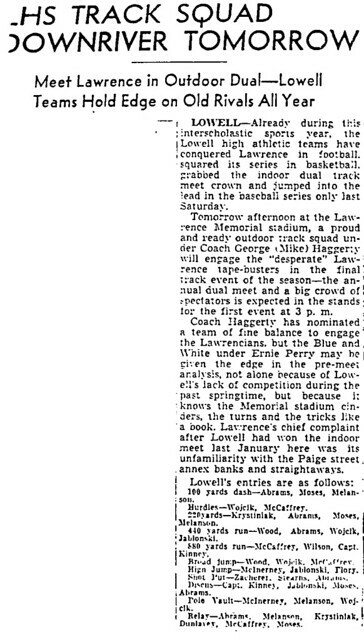 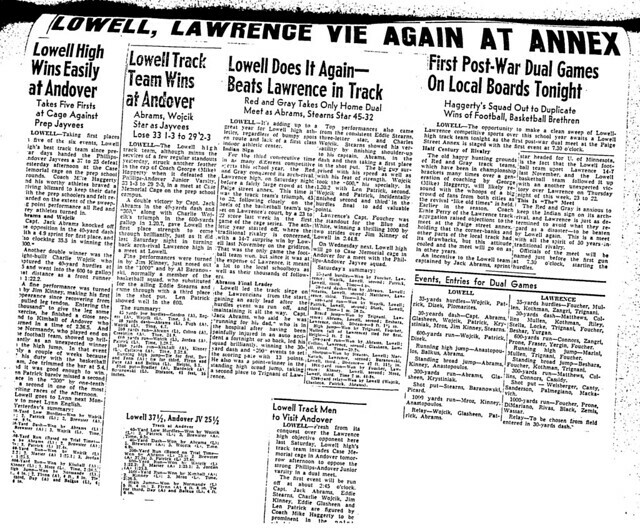 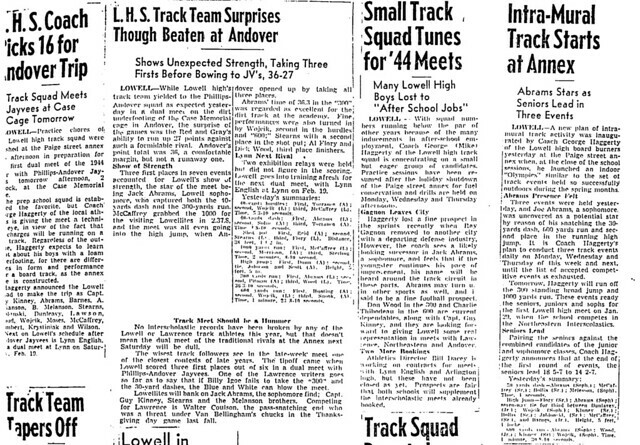 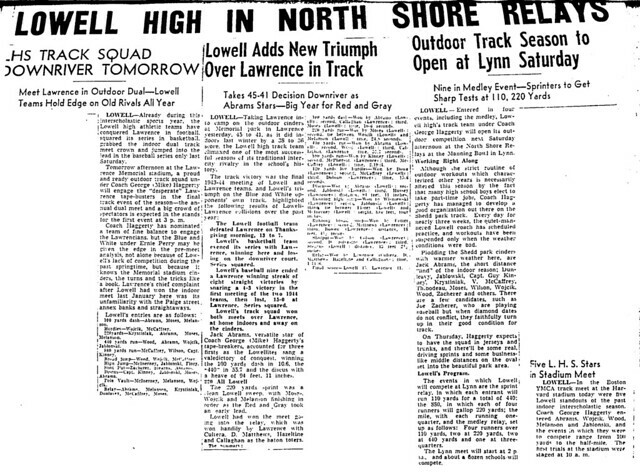 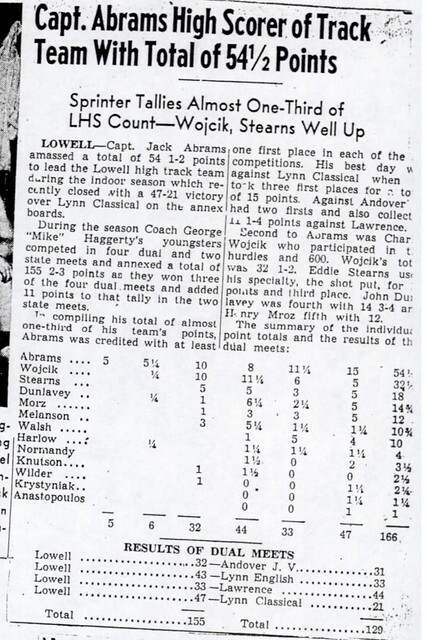 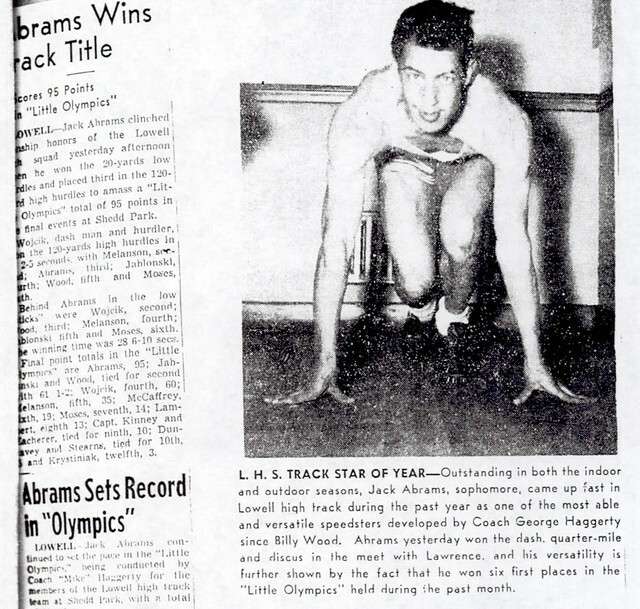 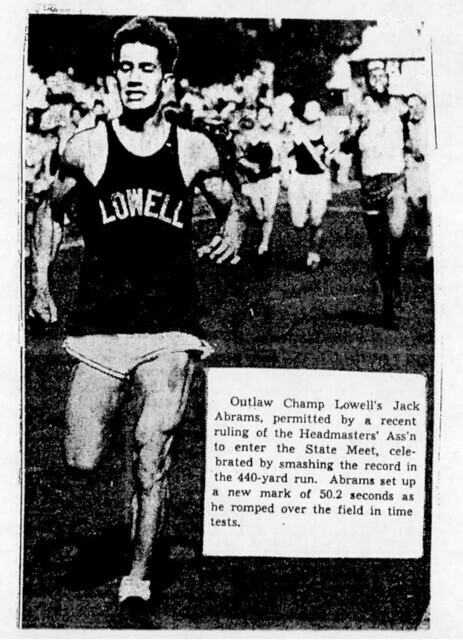 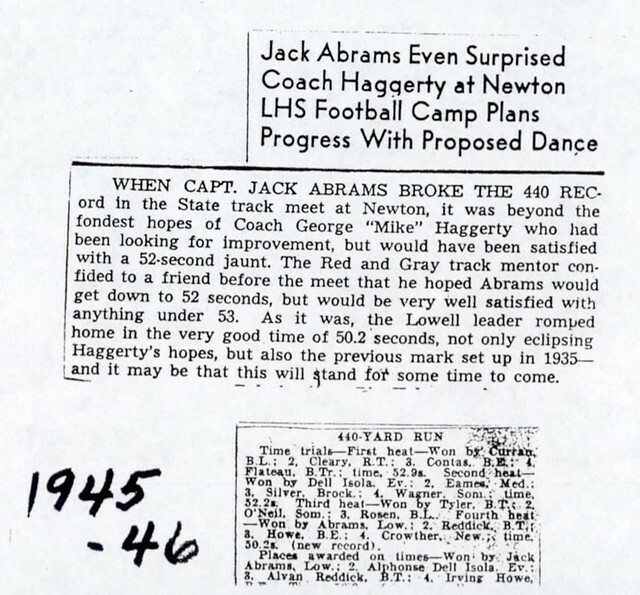 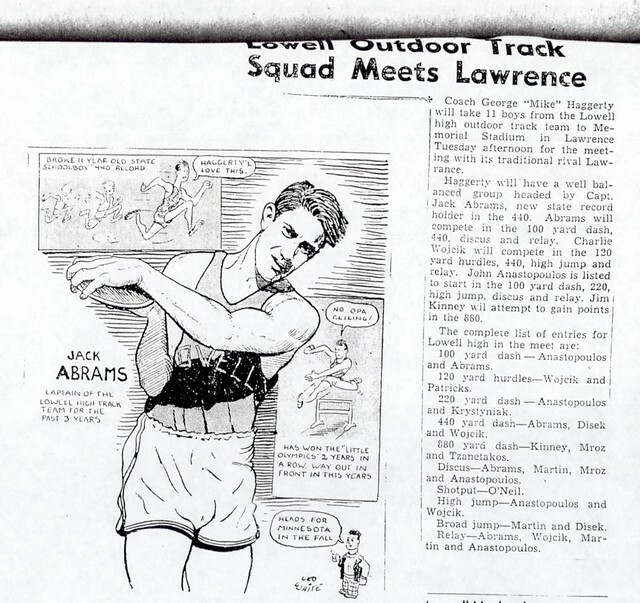 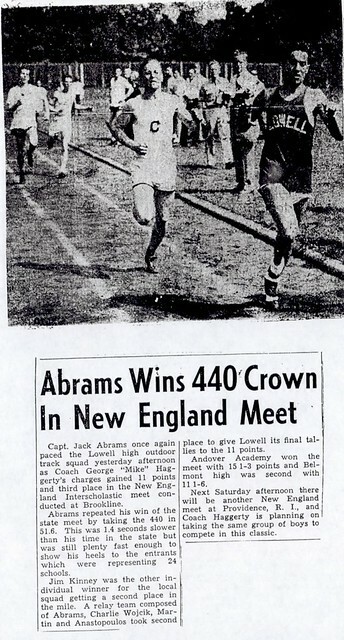 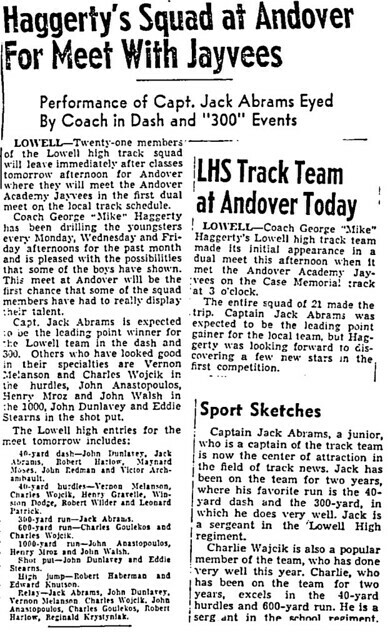 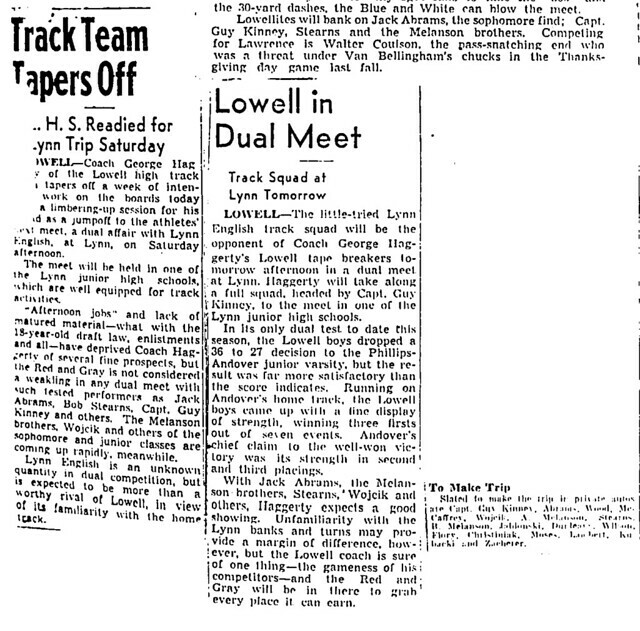 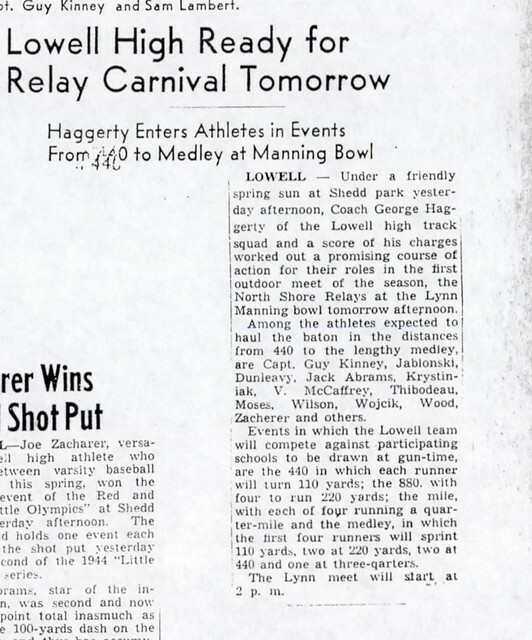 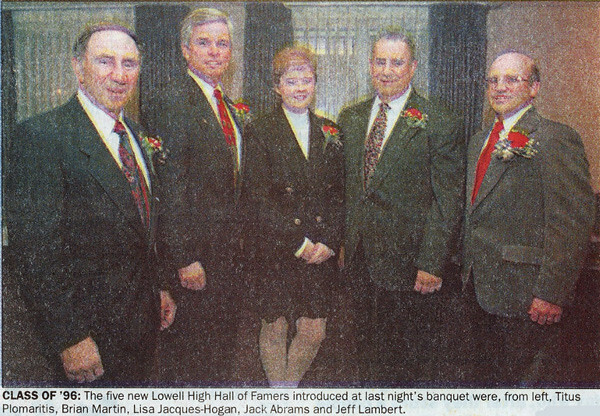 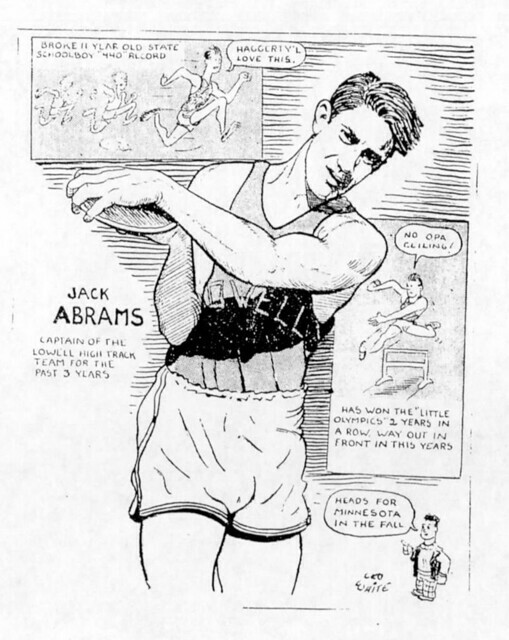 One of the truly dominant sprinters of the Hall of Fame Coach George “Mike” Haggerty era at Lowell High School, John Abrams achieved success at the Local, State, and New England levels during his four-year track career. 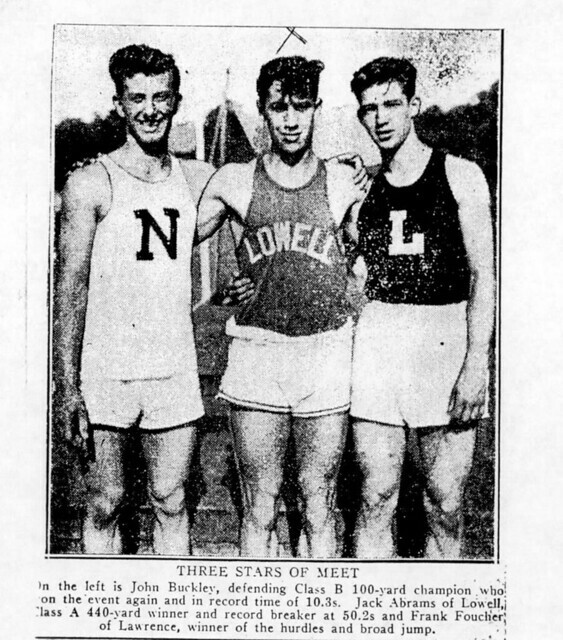 A Two-Year Captain, John led the Red & Gray in points scored for 3 consecutive years, while regularly winning 3–4 events in Dual Meets. 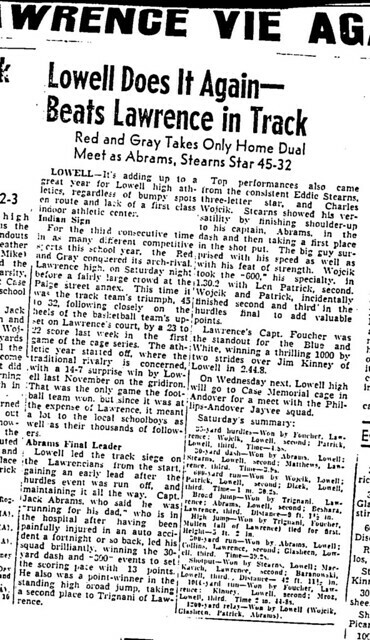 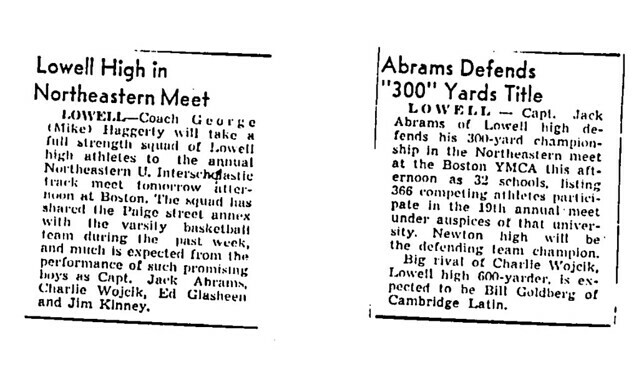 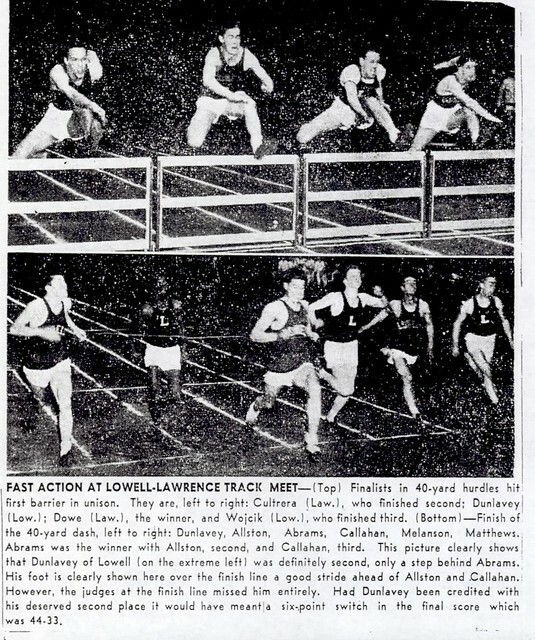 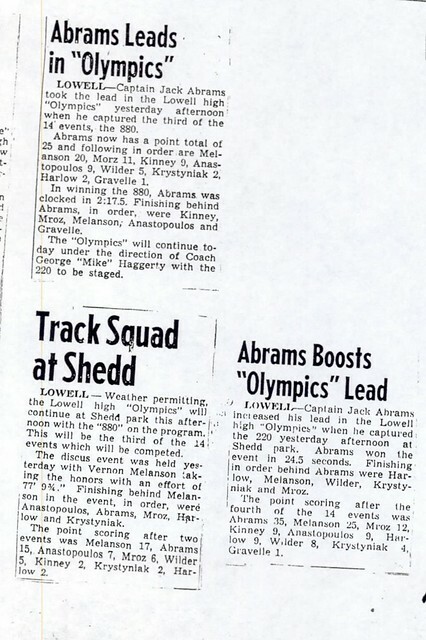 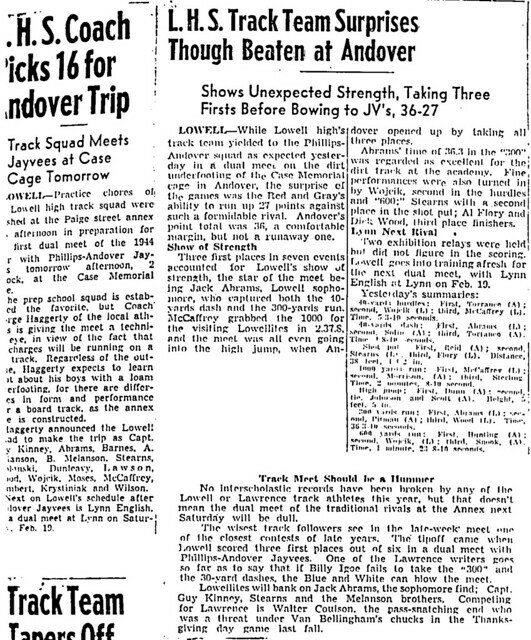 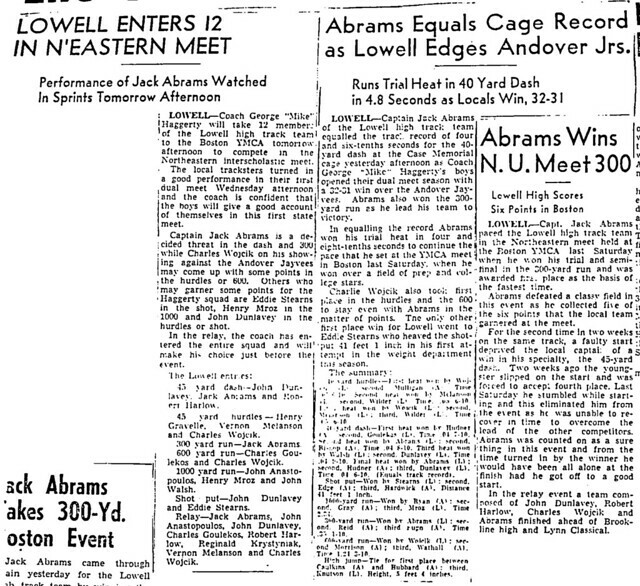 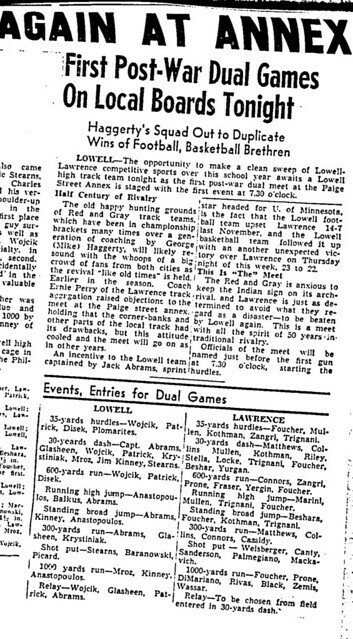 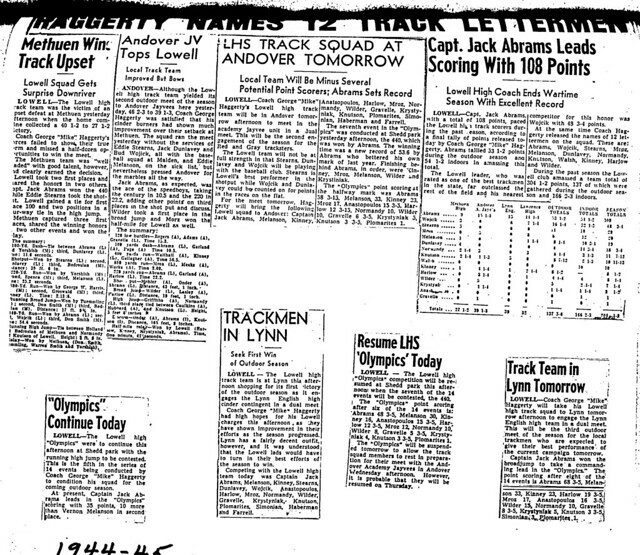 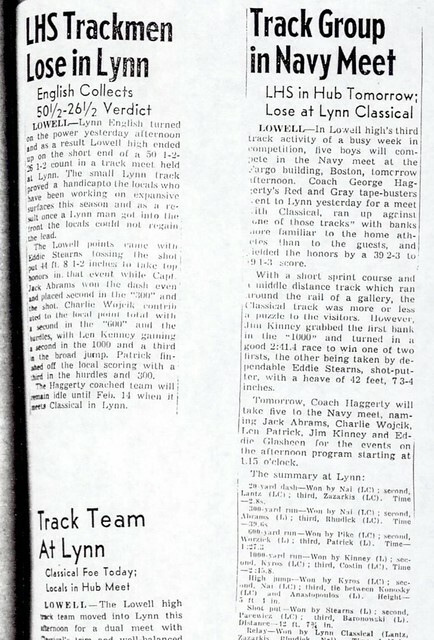 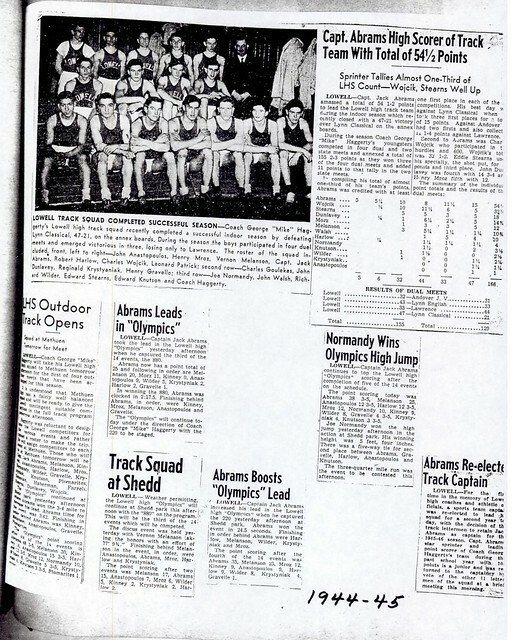 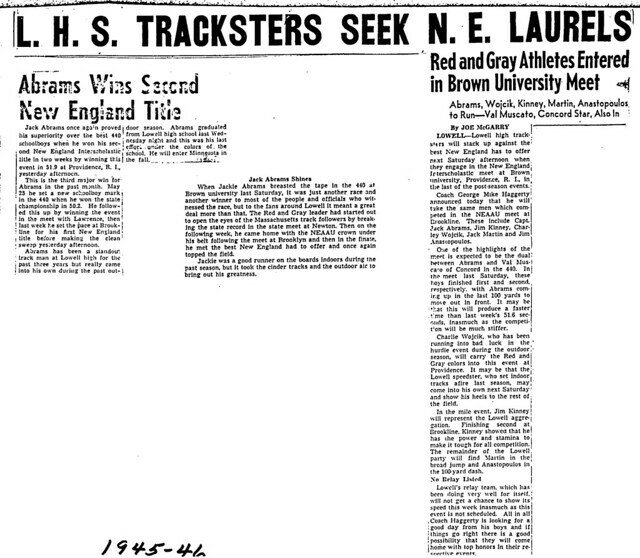 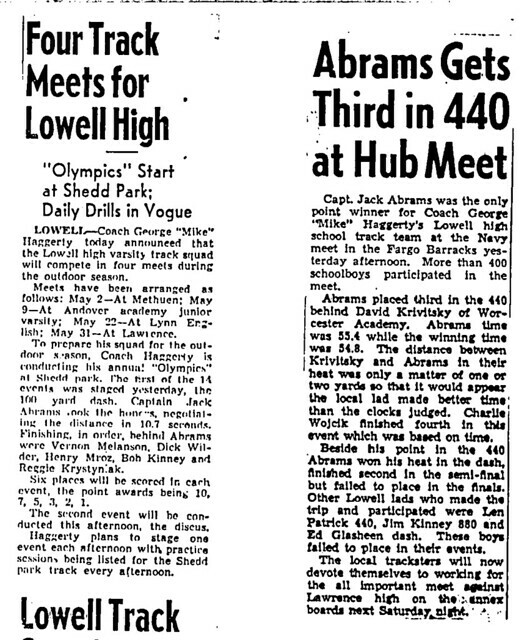 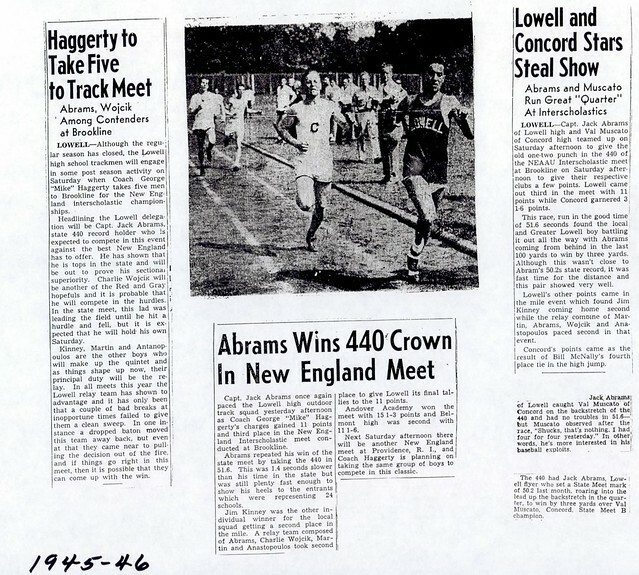 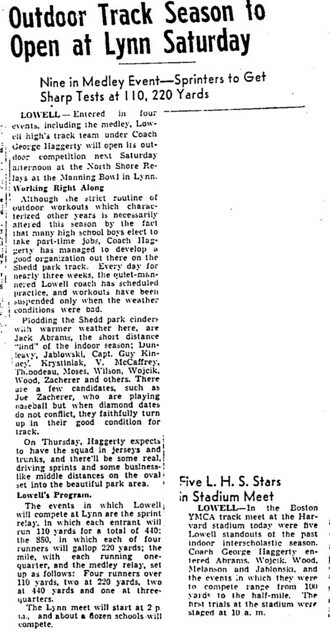 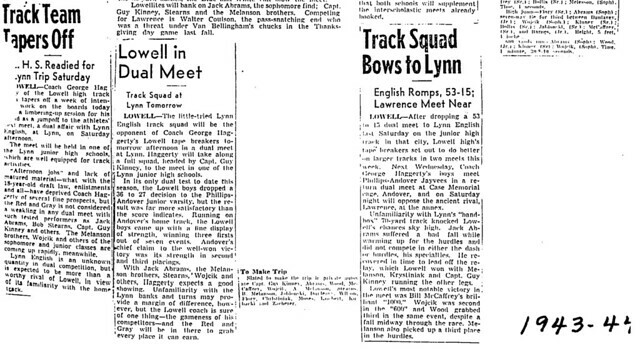 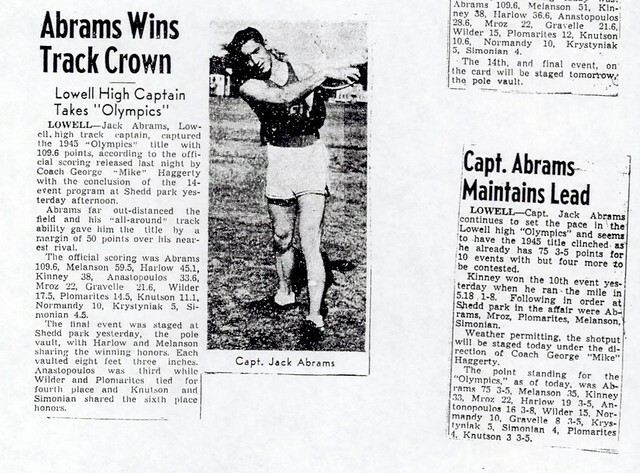 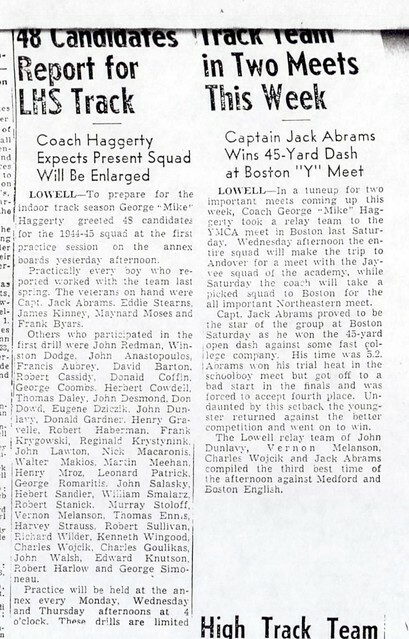 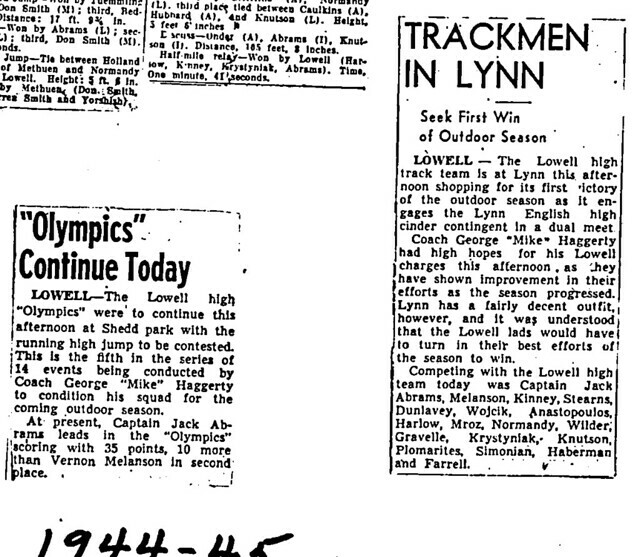 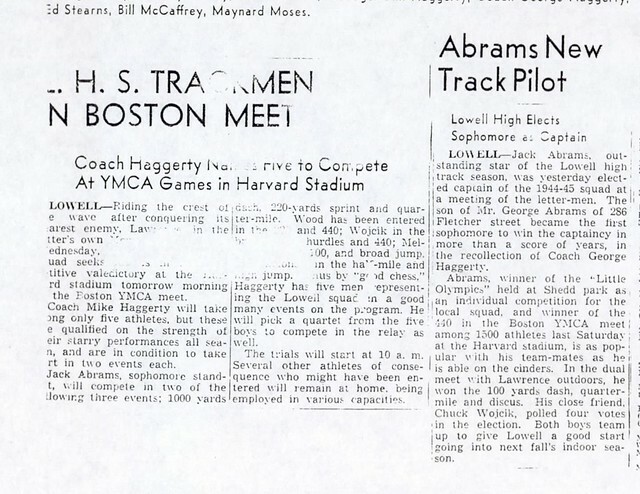 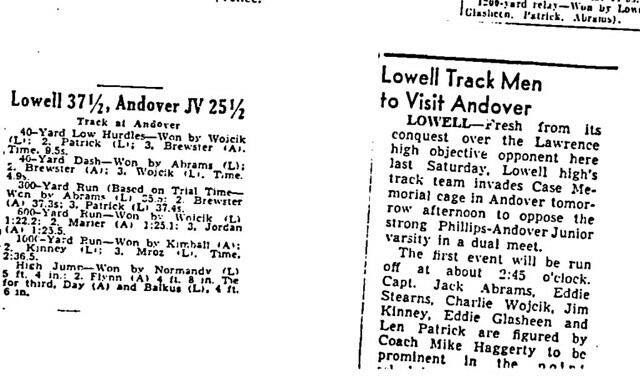 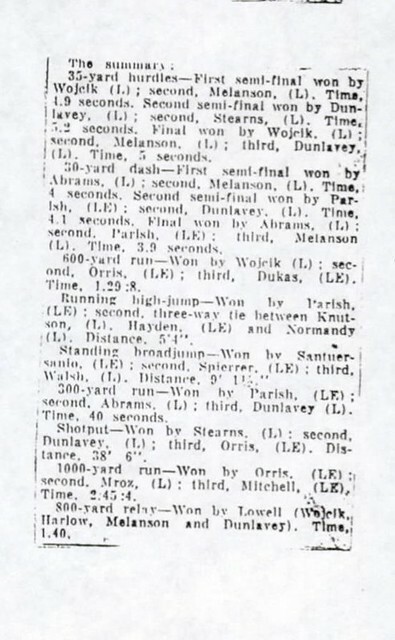 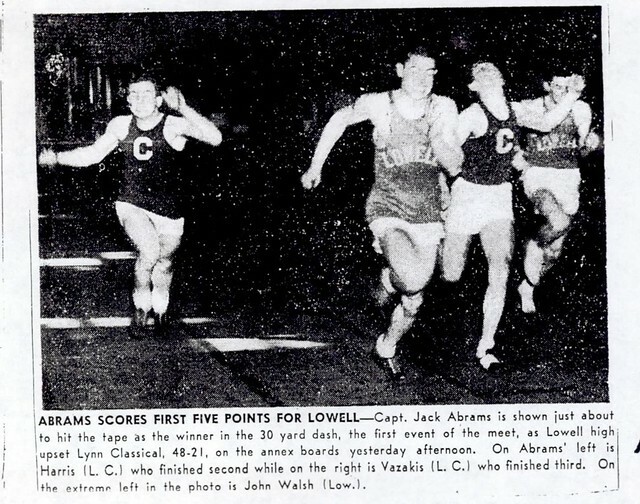 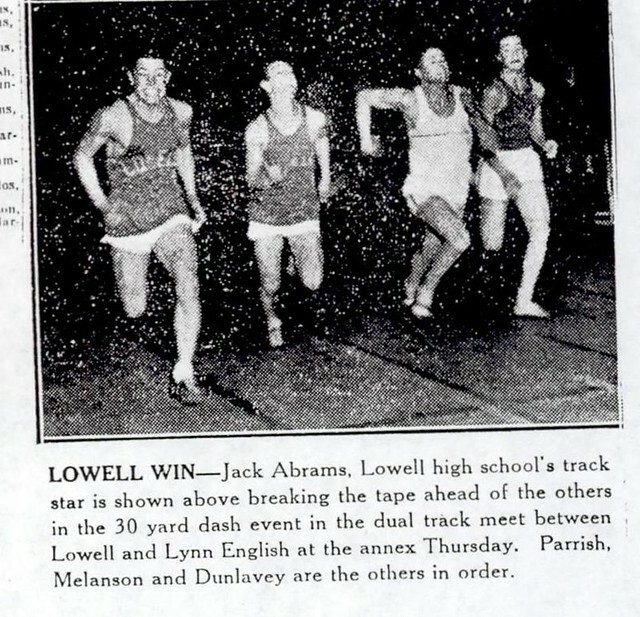 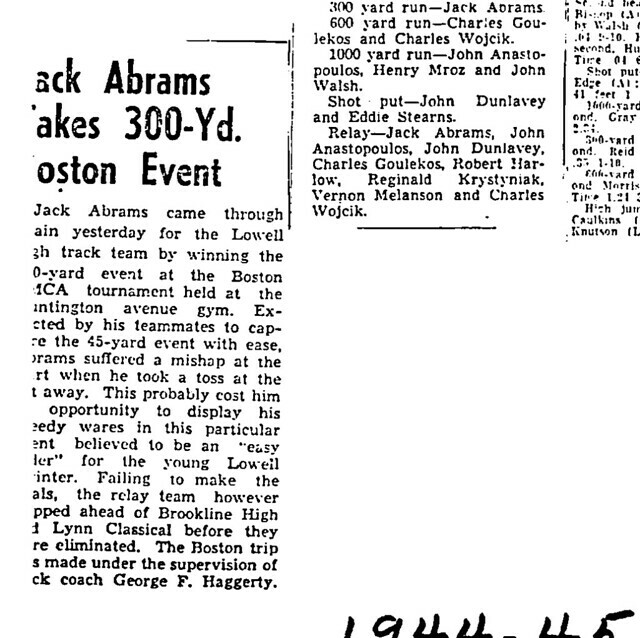 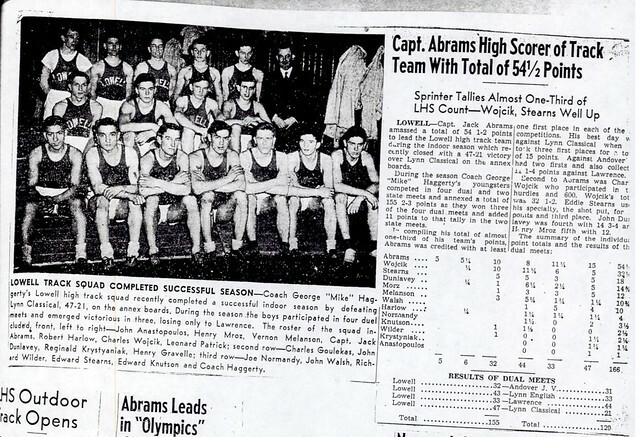 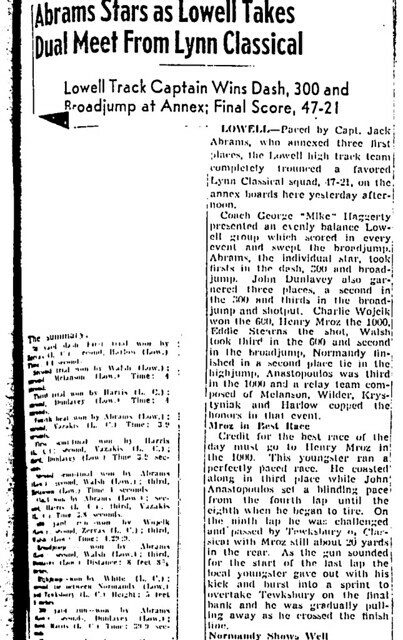 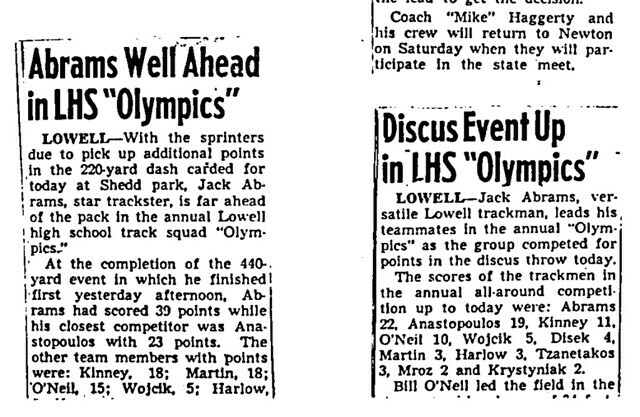 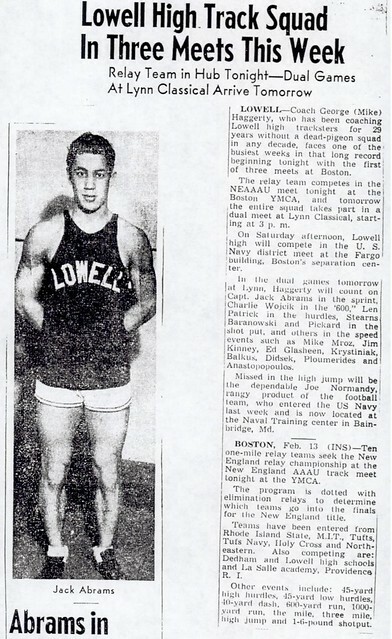 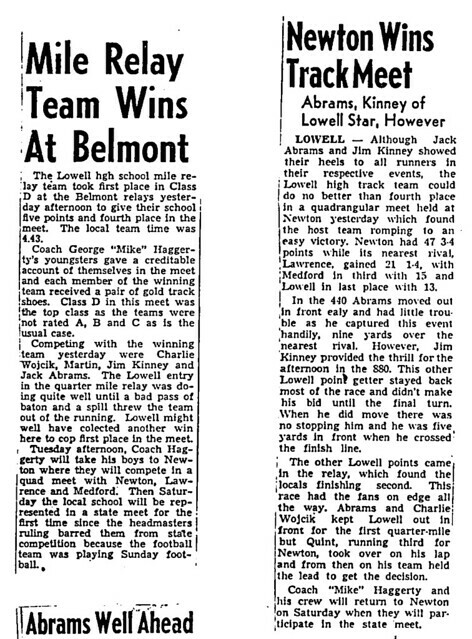 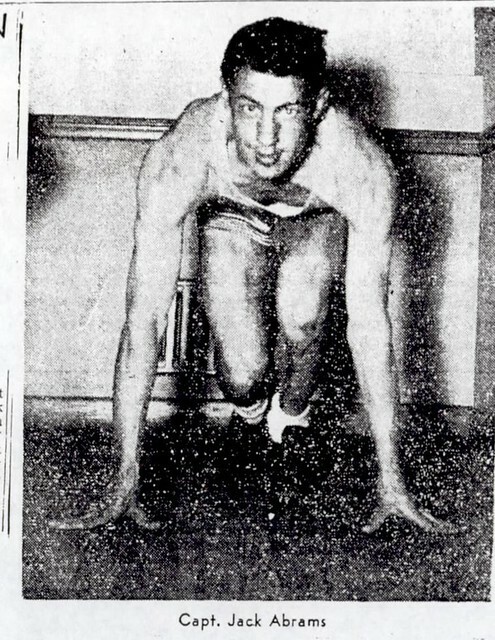 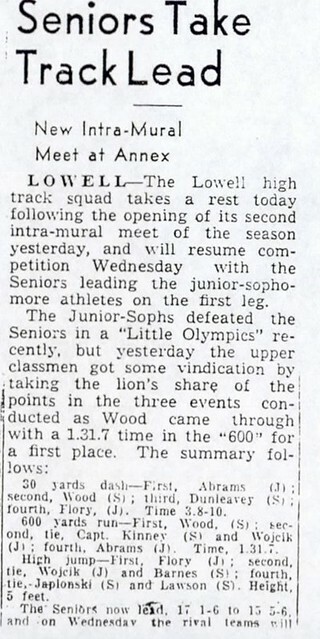 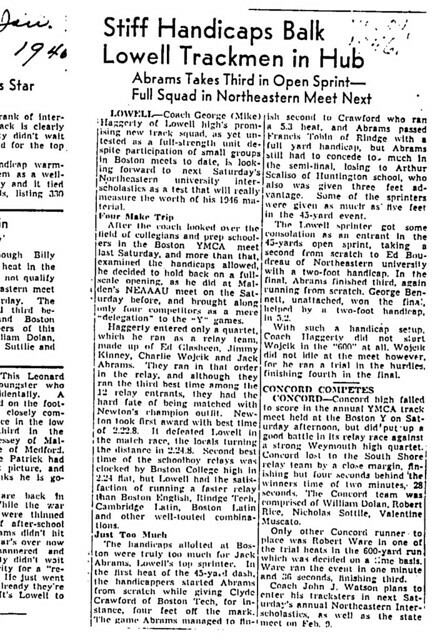 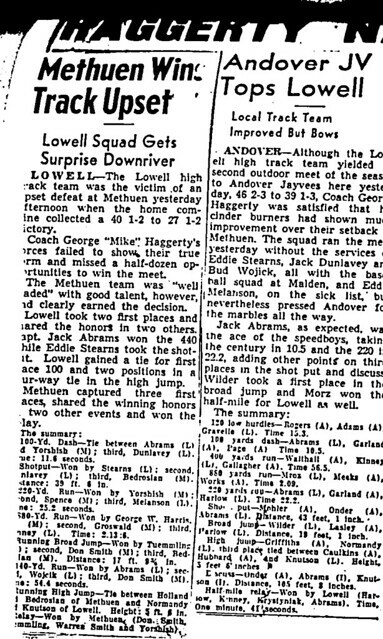 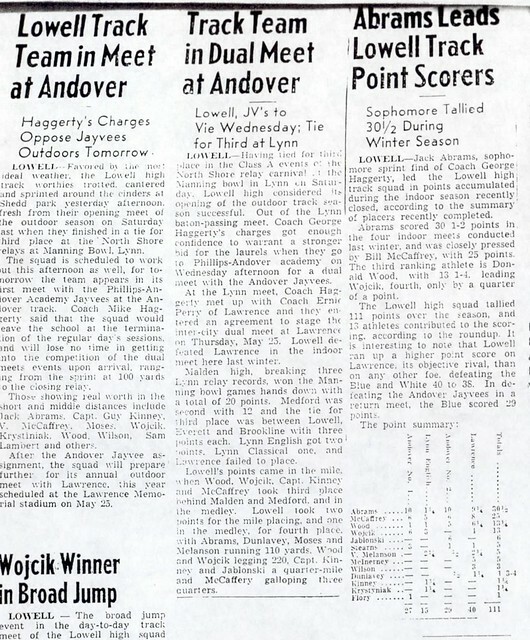 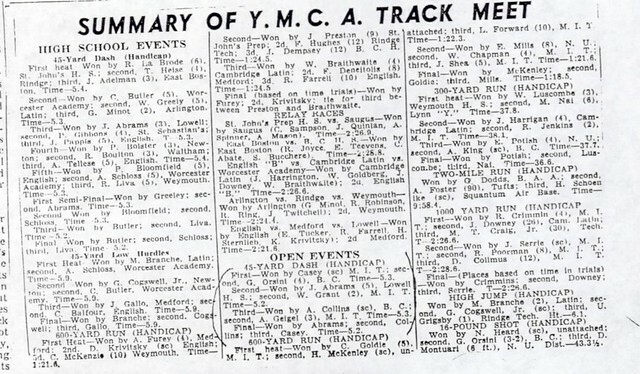 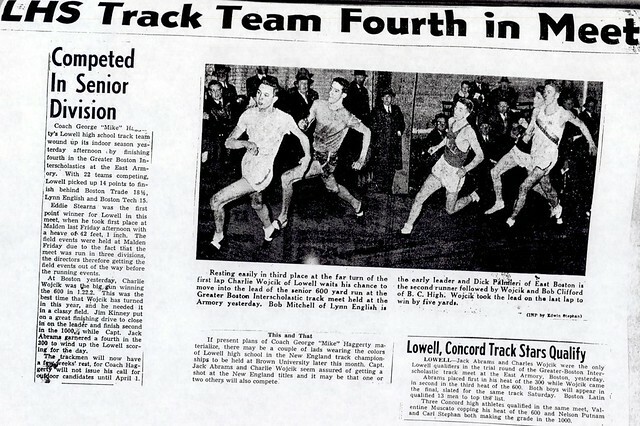 As a sophomore (1943–1944), John won the 45-yard dash at the Boston Y.M.C.A. 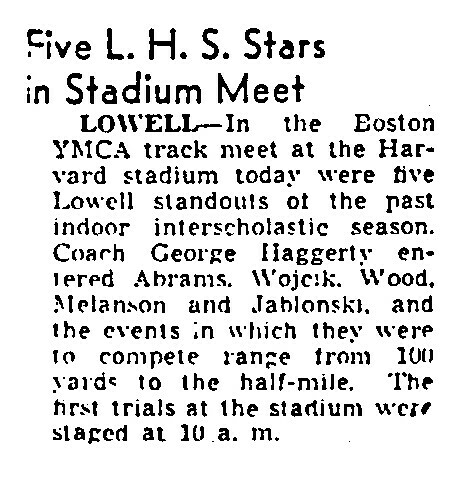 State-Wide Interscholastic Meet and the prestigious Boston A.A.U. 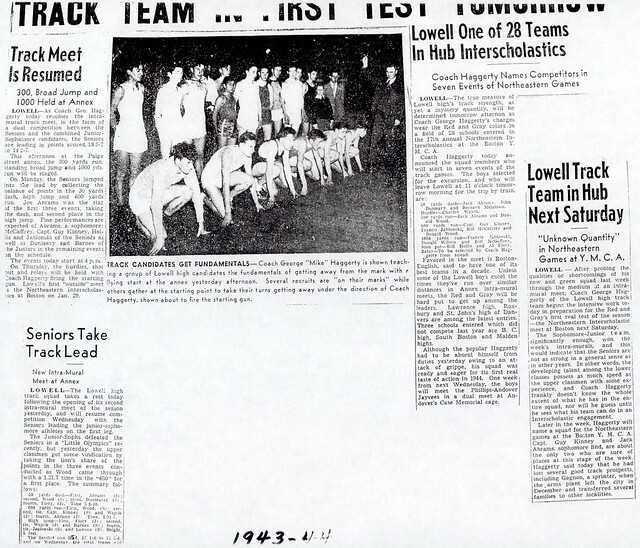 Meet. 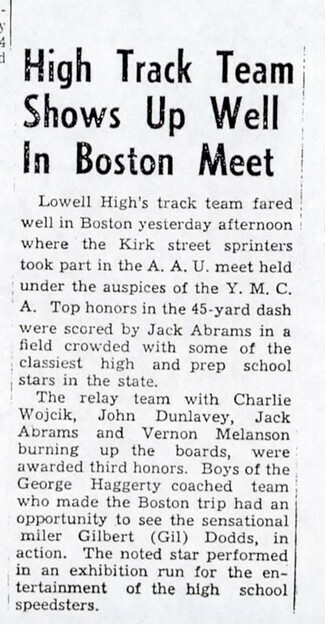 He added an important victory in the 300-yard dash at the Northeastern University Interscholastic, another meet with statewide participation. 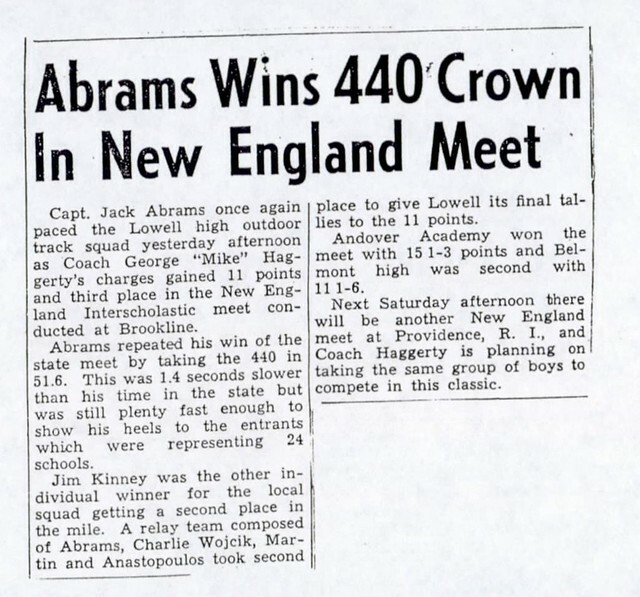 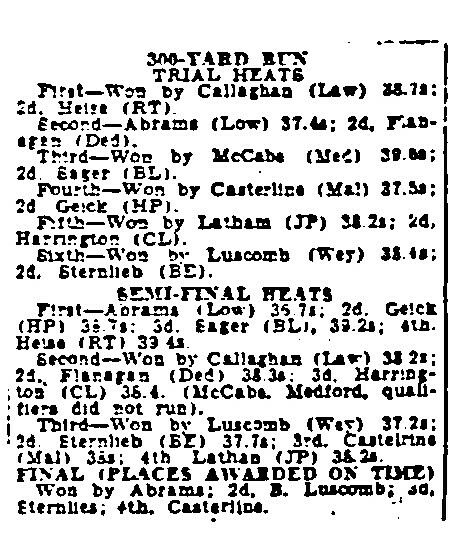 During his Junior Year (1944–1945), John repeated his 300 victory at Northeastern and added a 440 win at the Harvard University Interscholastic Meet. 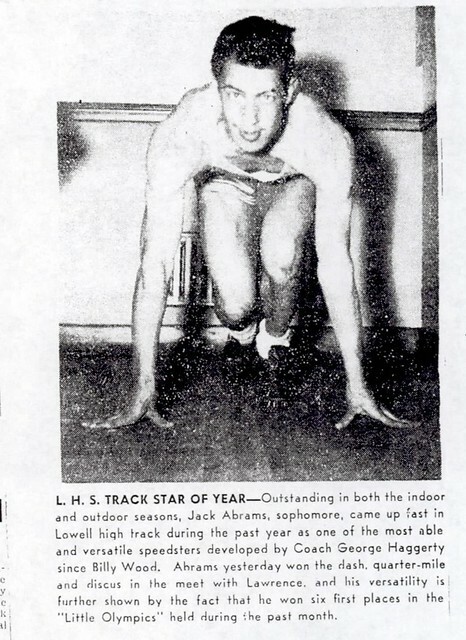 Perhaps the highlight of his year was a third place finish in the B.A.A. 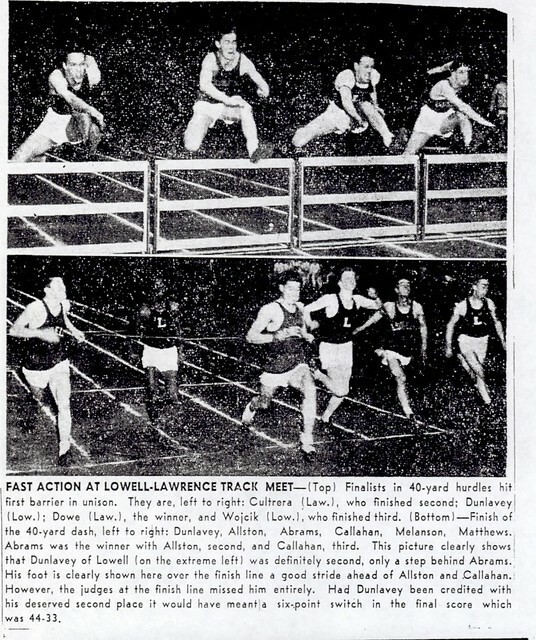 Invitational open 50-yard dash, a race in which John was the only High School competitor in a field of collegiate runners. 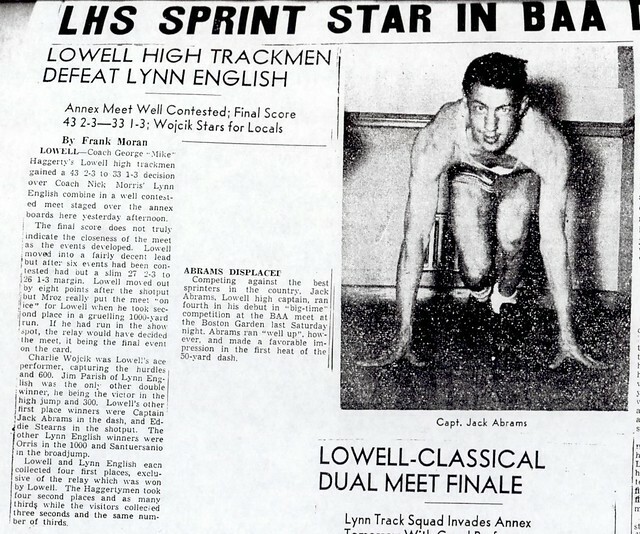 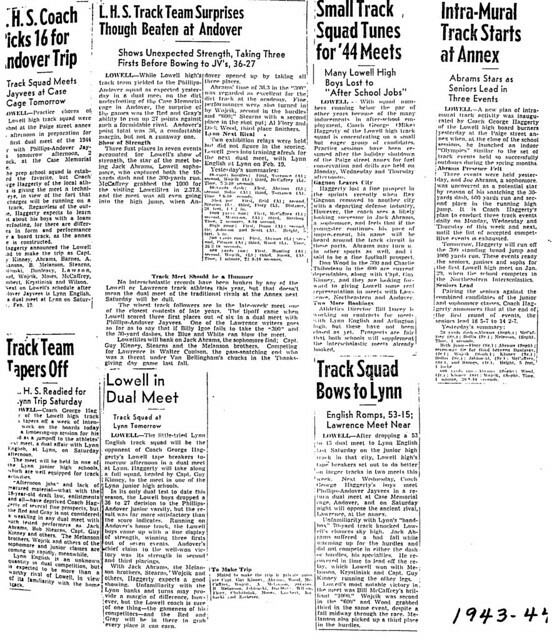 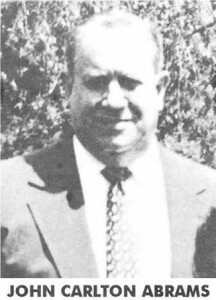 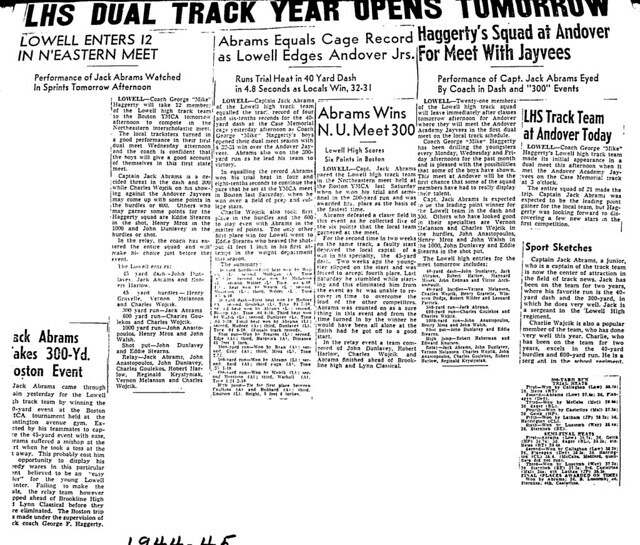 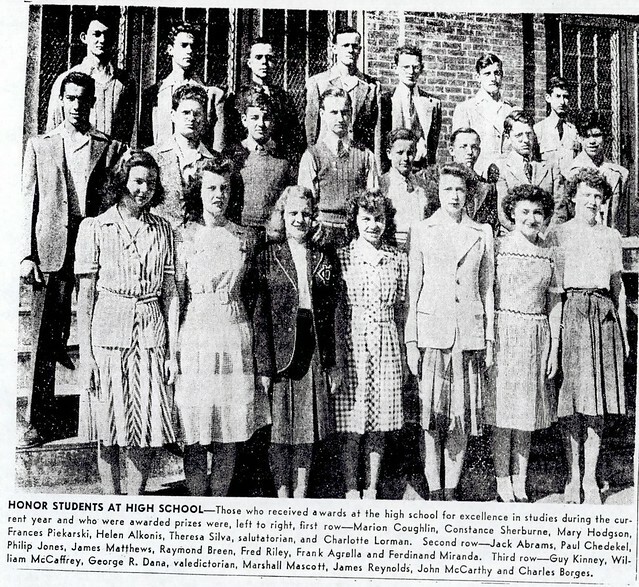 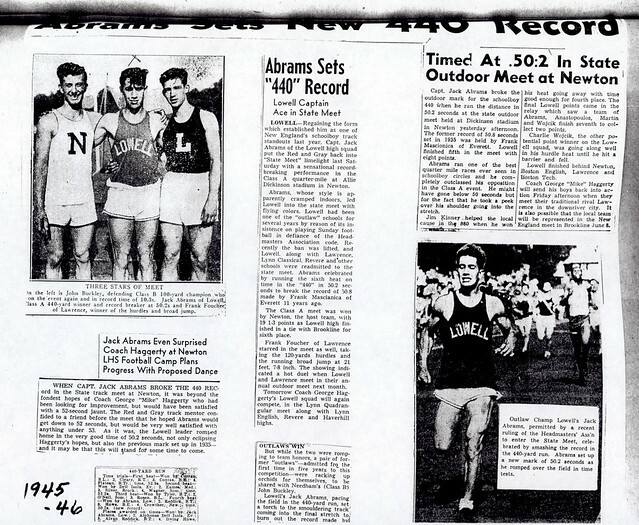 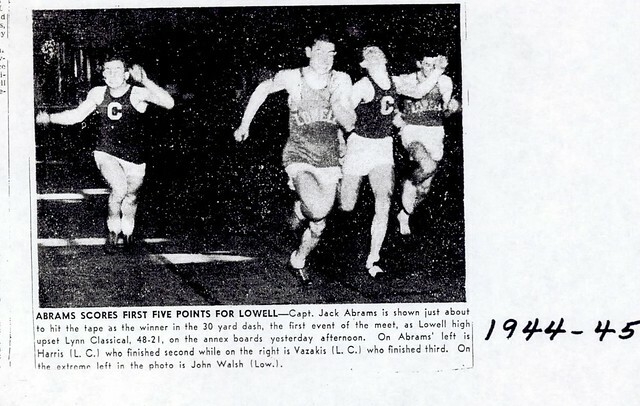 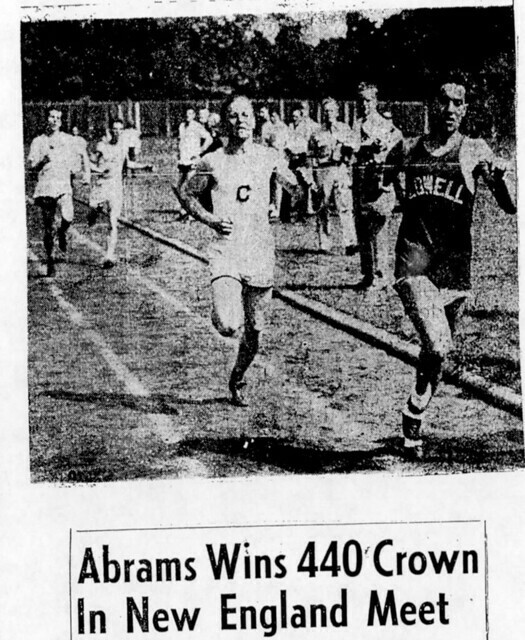 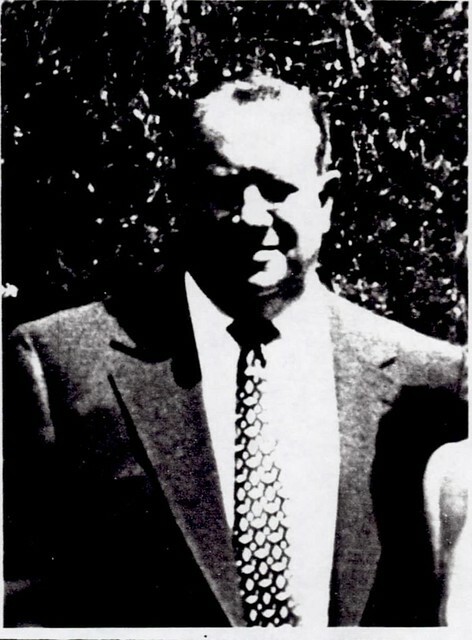 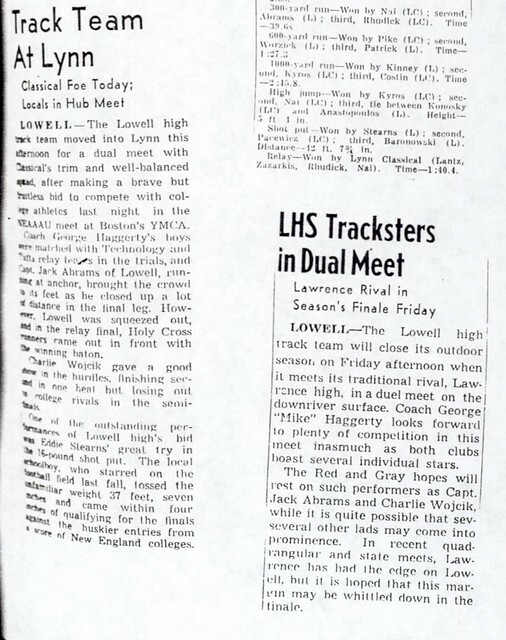 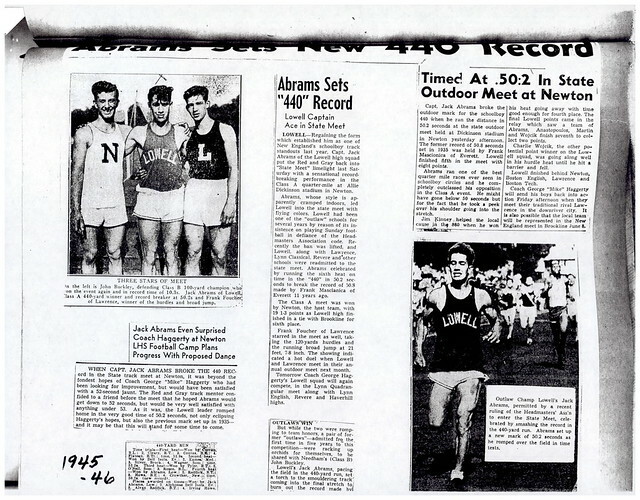 As a senior (1945–1946) John moved up to the 440, winning the event at the Massachusetts State Meet and New England Interscholastic Championship Meets in Boston and at Brown University. 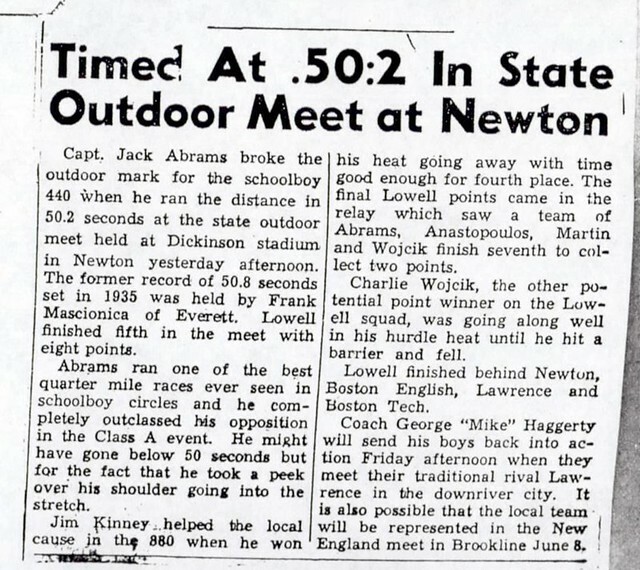 His time of 50.2 seconds at the State Meet established a new Massachusetts State High School record for the event.